Featuring Serge, Radioactive Man, Sully, Donga, Gerry Read and Fracture. 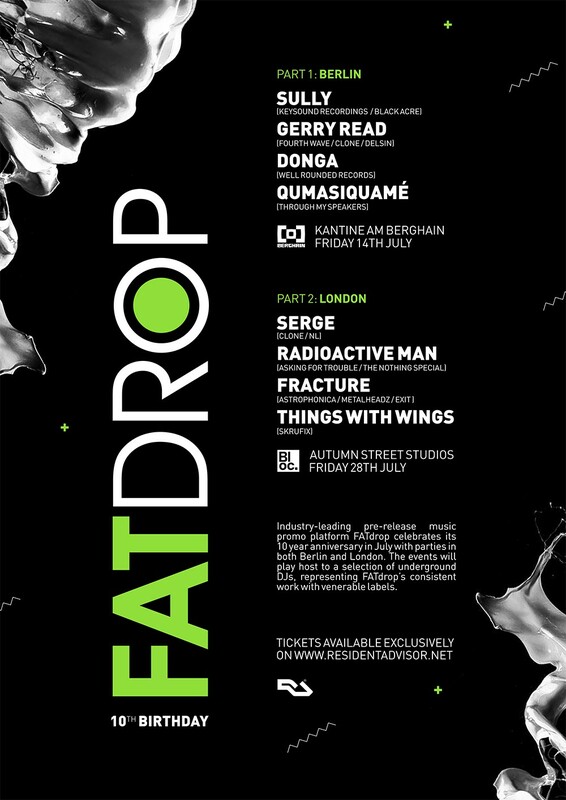 It’s been a decade since FATdrop arrived on the scene and revolutionised digital music promo, and we reckon that’s worth a party or two. FATdrop started out in the UK in 2007, and opened another office in Germany in 2009. This July, we’re celebrating in both London and Berlin with underground lineups representing music scenes that have shaped and enriched our lives. Within one of the world’s most iconic clubs, we’ll play host to Sully, Gerry Read, Donga and Qumasiquamé. Releasing on pioneering labels such as Keysound and Astrophonica, Sully’s decade of musical output blends UKG, dubstep and two-step. His more recent releases have been nu-jungle focused, channelling the character of ‘94 with his own distinct production style. Well-known for his output on Fourth Wave, as well as having released on numerous top labels such as Clone, Delsin, Aus Music and 2nd Drop, Gerry Read brings his unique blend of rough and warped house. Owner of Well Rounded Records and the eponymous Brighton vinyl store, Donga is one the UK’s finest selectors, with well over 20 years in music. He’s also officially one the most underrated DJs in the world. Born in Hamburg and with roots in Ghana, Qumasiquamé is part of the Berlin- and London-based Through My Speakers crew. He recently played Boiler Room’s second Berlin rooftop party. Locals love Bloc’s Hackney Wick venue, and for good reason. For one night only, we’re commandeering the warehouse and handing the controls to Serge, Radioactive Man, Fracture and Things With Wings. Owner of Rotterdam record store, distributor and label network, Clone, Serge does A&R for labels releasing everything from classic house reissues to basement tracks and electro. Clone had its own birthday earlier this year (at a respectably mature 25), celebrating with a massive European tour. Radioactive Man is a highly respected and consistent electro producer known for a rich back catalogue, including collaborations with Andrew Weatherall, most notably under the Two Lone Swordsmen moniker, and early releases on Rotters Gold Club. More recently he’s released on Craig Richards’ seven-inch-only sub-label, Tuppence, and an album on the new Asking For Trouble label. One half of dnb duo Fracture and Neptune, Charlie Fieber runs Astrophonica, and has been making and releasing music for 15 years. His tracks have also appeared on labels such as Metalheadz and Exit Records. Berlin-based Skrufix label boss Things With Wings provides support in the form of freestyle world beats and grooves.